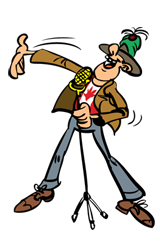 The Comic Strip is located on Bourbon Street in West Edmonton Mall. The Bourbon Street Entrance is Entrance Number 6. We are located right across from Moxies Restaurant and right beside Tony Roma's.